Some people refer to Hanukkah as the “Jewish Christmas” mainly because it takes place in December. Although Christmas is always on the 25th December the Hanukkah dates change according to the Jewish calendar (25th Kislev). This year Hanukkah falls exactly on Christmas Eve, the night of the 24th December 2016. The Jewish holiday of Hanukkah celebrates a miracle which took place in 139BC. At the time the Syrian-Greeks ruled the Holy Land and sought to Hellenize the country. Jews were forbidden to practice their religion and were banned from the Holy Temple which stood on Temple Mount where the Dome of the Rock stands today in the Old City of Jerusalem. A small group of Jews led by Mattathias and his five sons led a rebellion against the Greek ruler, Antiochus. They managed, against all odds to liberate the Jews and reclaim the Temple. They rededicated the Temple to God and sought pure olive oil to light the Temple’s eight-branched candelabrum (menorah). After searching they found only one small jar of oil which miraculously managed to keep the menorah alight for eight days until new oil could be prepared. To reminding the people of God’s miracle and how the few faithful could overcome evil the religious sages ordained that this event would be commemorated by a religious holiday – Hanukkah. What does the word Hanukkah Mean? 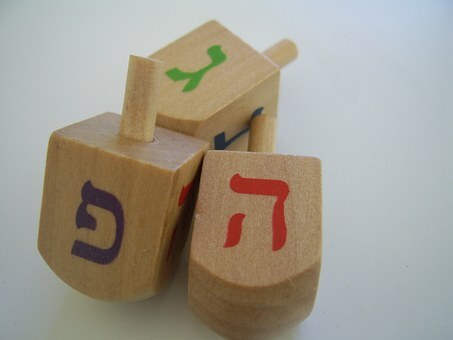 The word Hanukkah, Chanukah, Hanukkah or חנוכה comes from the Hebrew word “hanu”(חנו) for dedication/consecration or inauguration (of the Temple) plus the Hebrew alphanumeric letters for 25th “ka” (כה) indicating that it took place on the 25th of the Hebrew month of Kislev. The symbolism of Hanukkah is light overcoming darkness, purity overcoming evil and spirituality over materialism. Hanukkah is celebrated for eight consecutive days. 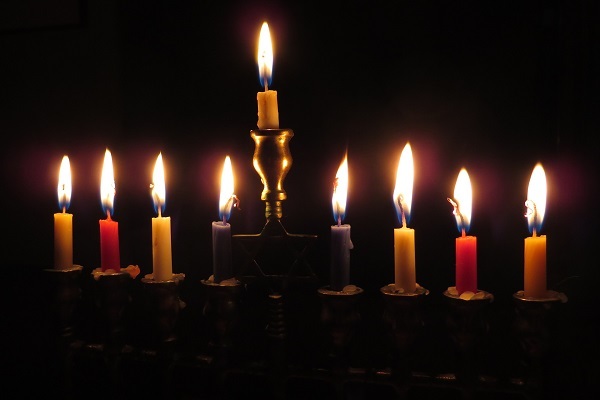 Each night a candle is lit on the menorah and each night an additional candle is added while saying blessings. By the eighth night all the eight candles are lit. The lighting of the candles is accompanied by songs and happy celebrations. Traditional Hanukkah foods are prepared with oil to remind us of the miracle of the jar of oil. Traditional Hanukkah foods include potatoes pancakes (latkas) and Hanukkah doughnuts (sufganiyot). Unlike American doughnuts the Hanukkah doughnuts have no hole in the middle and are filled with delicious strawberry jam. You can see doughnuts sold at all supermarkets, restaurants, cafes and even corner stores throughout Hanukkah. In fact the art of Hanukkah doughnut making has been taken to a new level and now you can find doughnuts filled with chocolate, cream, caramel, alcohol, toffee and topped with sprinkles, chocolate, frosting and cream. 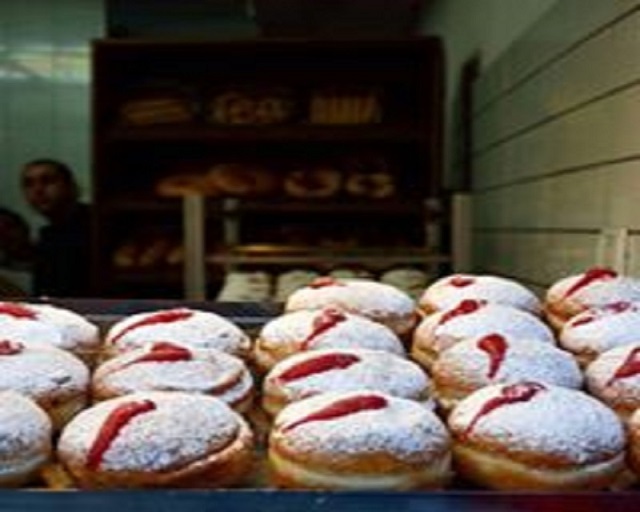 One of the best places to see a full range of doughnuts is the Israeli bakery and coffee shop chain Roladin. It is traditional to gives kids a little money or gift on Hanukkah and even one gift on each of the eight nights. This tradition was influenced by Christmas. Probably Jewish kids were jealous of their Christian friends who got Christmas presents and so the tradition was introduced. There is another explanation for gift-giving on Hanukkah. It can be traced back to the ancient tradition of Hanukkah gelt (money) which was charity given to the poor so that they could afford to buy candles to light during Hanukkah. Another great thing about Hanukkah is that although it is a religious holiday it is not observed like a Shabbat. Shops, restaurants, bars, nightclubs, stores and businesses of all kinds have normal open hours. The only difference is that Israeli school kids are on holiday and many special events are held for all the family.